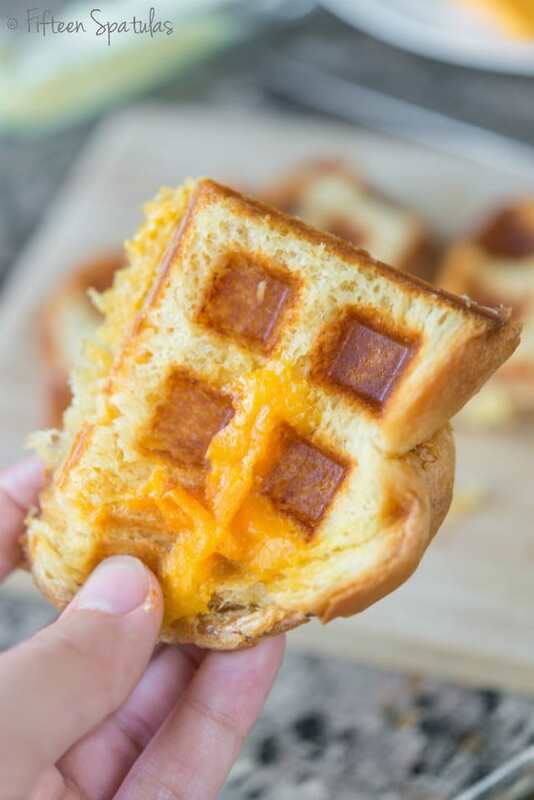 Classic grilled cheese sandwiches are pressed in the waffle maker for extra crispy nooks and crannies! 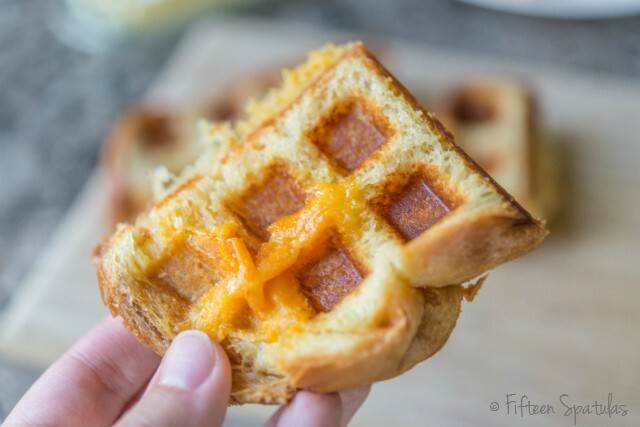 Did you know you can do WAY more with your waffle maker than just make waffles? If you’re a fan of all things crunchy and crispy, there are a ton of recipes that utilize all the nooks, crannies, and crevices off the waffle maker to make extra crispy treats. 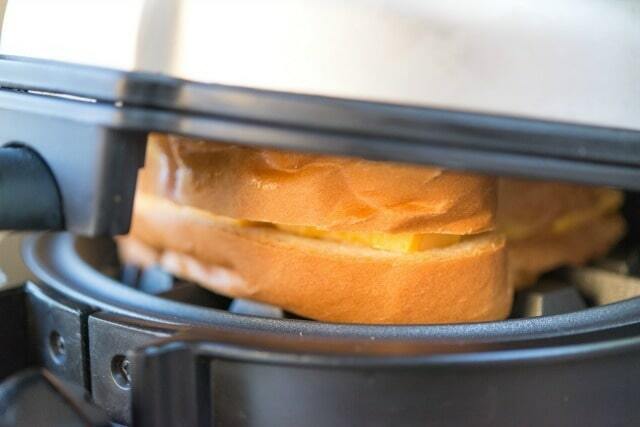 For sandwiches, a waffle iron is kind of like a panini press on steroids. A couple months ago I was trying to perfect a waffle recipe and decided I was unhappy with my waffle iron, so I got in touch with KitchenAid to see if I could test out their waffle baker. I’m a big fan of the brand and know that every product they make is a top quality workhorse (I have a KitchenAid hand mixer that’s a hand-me-down from my dad)! Before we talk about this sandwich, first I have to say that their Waffle Baker makes totally dreamy waffles. I have never had such evenly cooked, mega crispy waffles in my life, and I love that I can make two big waffles at the same time. If you’re a big fan of breakfast, their waffle baker is absolutely worth getting for the waffles alone. But let’s get back to showing you this grilled cheese! 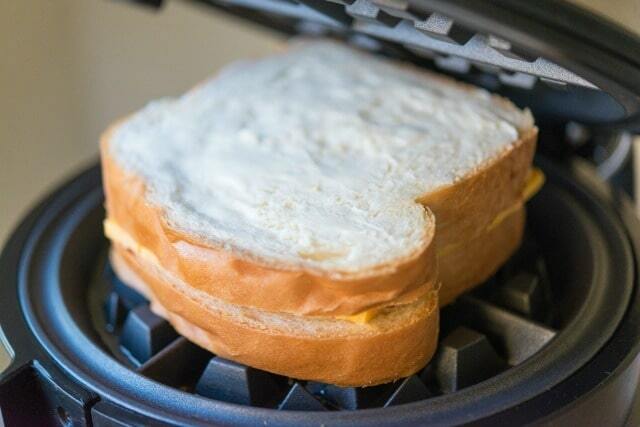 After a few minutes you can check on the crispiness, and cook the sandwich to your liking. Here you can tell there are plenty of brown spots and the cheese is melted, but usually I like to take my sandwich a little further. 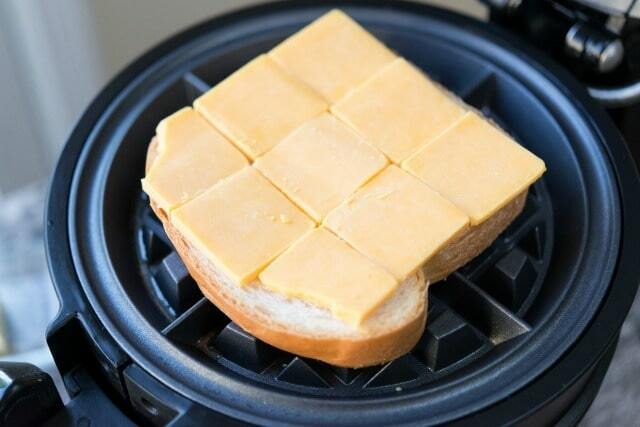 Preheat the waffle iron while you assemble the sandwiches. Spread one slice of bread with butter, only on one side (this is the side that will have direct contact with the waffle iron). 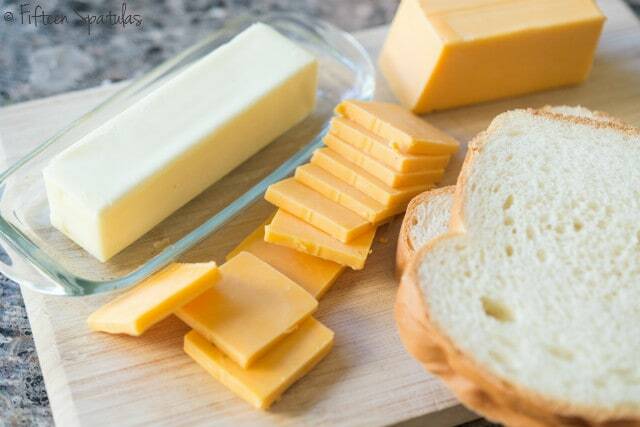 Place the cheese slices on top of this slice of bread, then spread the other slice of bread with butter, only on one side. 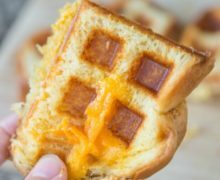 Place the unbuttered side against the cheese, then place this entire sandwich on the waffle iron. Close the top of the waffle iron, but do not press down and smash the sandwich. 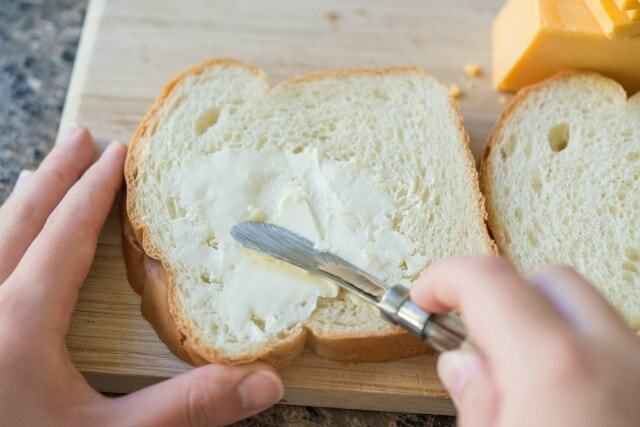 Let this cook for 3-5 minutes until the bread is brown and crispy and the cheese has melted. Enjoy! Disclosure: KitchenAid provided me with their Waffle Baker for review purposes, but all opinions are my own. I just recently stumbled upon your blog and love what you are doing! This is the BEST idea ever! I LOVE it! 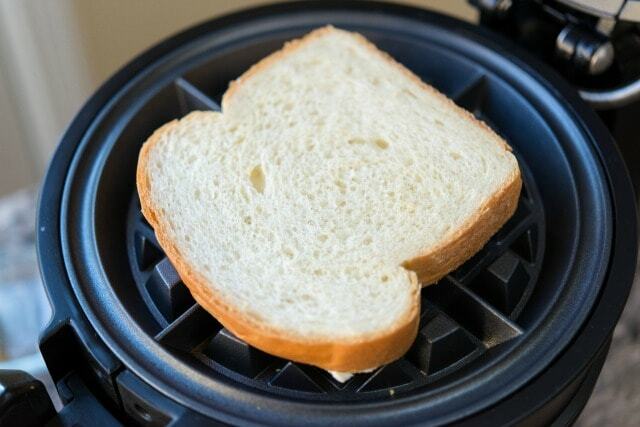 Never even thought to put bread in a wafle maker! I am so going to do this! My husband is going to love you! 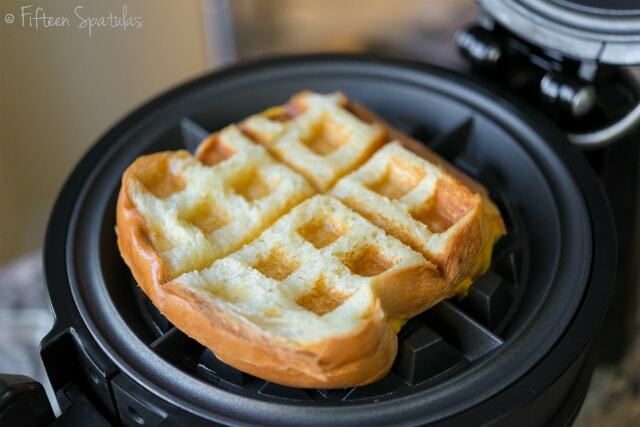 Been looking for new ideas on how to use my waffle maker for more than just waffles! Great idea! Going to try this next time! Thank you! Question: I have heat settings 1-5 on my cuisinart waffle maker. Which heat setting would work for this grilled cheese so it turns golden without burning? I use olive oil cooking spray to keep it a bit healthier.